Azteca horses are medium-sized, light riding horse. They arernan extension of the Spanish horse. 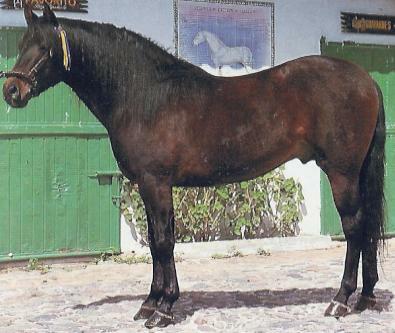 Although a majority of the horses in Mexicornare still of direct Spanish stock, the Azteca has become very popular in thernfew years that it has been an established breed. Standing 14.3 to 15 hands high, the Azteca is of standardrnwarmblood conformation.They have a fine, dry head with straight or subconvexrnprofile, small ears, and beautiful eyes. They have a well-placed, beautifullyrncurved and heavily muscled neck. They have long, sloping shoulders and a moderatelyrnpronounced instep. They have a short, strong back and a long, slightly fallingrncroup. They are found in all solid colors except piebald and tigers. At the beginning of the 1970s, the backcrossing of domesticrnhorses began in Mexico, as these did not meet the desired performance andrnquality requirements. As they go back largely to Spanish ancestors (Criollos)rnand from the neighboring USA, a new breed was created with Andalusian andrnQuarter Horse stallions and Criollo mares: the Aztecs.